New York’s winter electricity prices are expected to average about 9% lower than last year’s, the staff of the New York Public Service Commission said on Thursday. In a presentation to the commission, staffers said market conditions would benefit from better preparation and other practices refined over the past two winters, as well as from lower natural gas prices that have also influenced other eastern U.S. markets. “We have adequate resources to meet the needs of the utilities … while we’re also looking at lower commodity prices,” said Raj Addepalli, managing director for utility rates and services at the PSC. For example, at the New York Mercantile Exchange, futures prices for electricity in the New York City, Hudson Valley and Western New York zones range from about $11 to $23/MWh lower than they were a year ago. 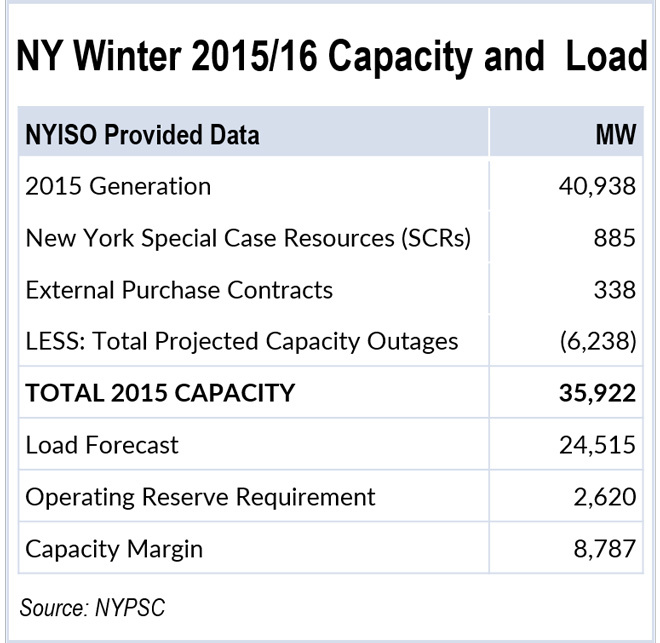 New York City futures prices averaged $91.06/MWh a year ago, while that same contract now averages $67.94. The PSC said utilities and the commission have instituted a series of “lessons learned” procedures that grew out of the polar vortex two years ago. Plants have increased their capacity for on-site fuel storage, especially in eastern New York, and state officials have implemented an expedited procedure to obtain permits from the Department of Environmental Conservation to allow fuel-oil burning. MISO has implemented several changes to improve coordination with pipeline operators and ensure fuel deliveries to its fleet.